Manufactured 10.20m (34’) wide and built to any length. Passageway 3.0m (10’) wide. Smaller passageways can be quoted. 3.0m x 3.6m (10’ x 12’) or 3.6m x 3.6m (12’ x 12’). Larger complexes available. All lined 1.168m (3’ 10") high complete with anti bite strips. Louvres - Two 609mm x 458mm (24" x 18") approx each end. 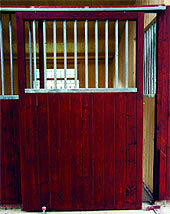 Doors - sliding 3m (10’) wide x 2.4m (8’) high, hung on heavy duty door gear, including personal door each end. Pennine Range timber frame Manufactured with top quality 22mm planed tongue and groove board and lined approx. 1.168m (3’ 10") high complete with anti bite strips above timber vertical galvanised bars. 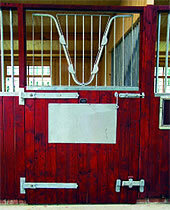 Hinged heavy duty stable door complete with galvanised anti weaver grid 609mm (24") galvanised hinges, kick bolt, pad bolt, anti bite strip and hook and eye. Clad to roof height with top quality 22mm planed tongue and groove board and lined approx. 1.168m (3’ 10") high complete with anti bite strips and fitted with galvanised bars above timber. Rear of each loose box complete with one stable window with galvanised bars. 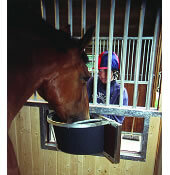 Top stable doors can be fitted on request. Manufactured with tongued and groove boarding on 150mm x 50mm (6" x 2") and 75mm x 50mm (3" x 2") covered with a high performance Hyparoof polyester green mineral felt. Skylights - four 915mm x 609mm (3’ x 2’) to each bay. Delivered and erected to most areas. FOR BROCHURE AND PRICE LIST ON AMERICAN BARNS.